If you read this blog through a feed reader, or just haven’t visited in the last week or so, you likely haven’t seen the new banner that I’ve put up on the right side of the site. It’s a lovely little banner (designed by me) for a White Paper / Report that I put together. The subject, fittingly, is Your Credit Score. In it, I write about what a credit score is, how it is used, and the steps that you can take to improve your credit score. My hope is that the report will be help people learn what the correct usage of a credit score are, and what the benefits are of having a good credit score. Which is why I’ve made it a FREE report. All you have to do is sign up for the Beating Broke newsletter. What is the newsletter? Well, it’s a bit in the fledgling state, but the idea is that you will get the occasional update about the site with an article or two as well as some articles and information that won’t appear here on the blog. I promise to not fill up your email inbox with the newsletter. In fact, at the moment, I only plan on sending it out once a month at most. More likely, bi-monthly. The report is well worth it if you ask me. 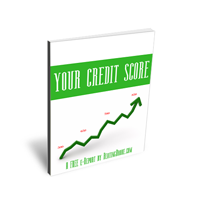 I’m a bit biased since I wrote it, but I really do think it could be a very valuable resource for someone who doesn’t know much about credit scores. Also, I want the report to get into as many hands as possible, so if you want a copy without signing up for the newsletter, just send me a note with the contact form and I’ll send you a copy.